Venox zerocoin is still in maintenance! So we are not effected by this. We can not impose what you have to do with your own money, but we want to assure you that the team is constantly working on the project. In the near future we will release a new wallet, update the website and a road map. We're still working on it and it takes most of our time. further development of the project, searching for and implementing new use cases for venox, marketing campaign. We are a team created from the community, and we do not give up despite all the difficulties that we face (BiteBTC, Cryptoslider Casino). Some bits take time and every serious investor should understand this. Birake Exchange need community support from you in order to list on Blockfolio! They are currently holding a voting contest. In order to vote you just have to do 2 small steps: 1. login through facebook, twitter, google, etc. 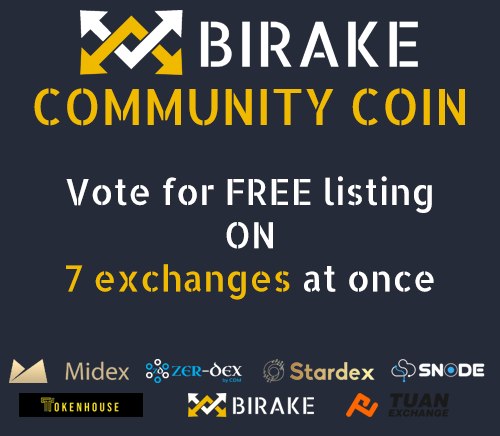 in the link above 2. vote by pressing the up arrow "arrow_up_small "
Venox won free listing on Birake network exchanges, so all will be able to see venox stats from this exchange via blockfolio. Incredibly we are passing for the bigest BTC volume on the last days, more than 77 bilion USD just today! However if you having problems to transfer BTC, and it takes a long time due huge BTC volume on the market can use this ViaBTC transaction acelerators! Now each user can setup own VNX Masternode, whitout usnig VPS console. Great tool for newbies and people who not have any idea about Linux. 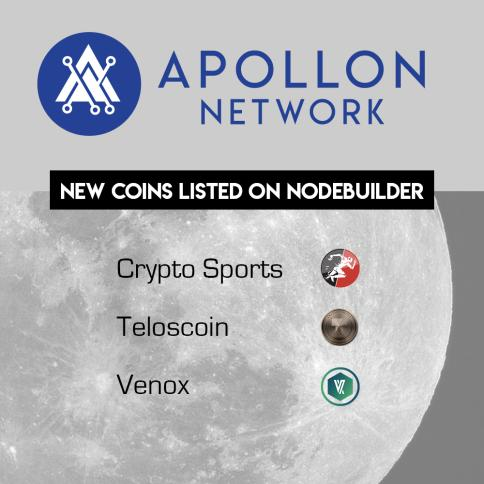 Apollon network system is compatible with Digital Ocean and Vultr, but soon it will be possible to run MN without external VPS. Venox listed on more services - more people will find Venox. Thank you all for your support. Together we can do more 💪🏼 We are expecting a few more news soon. Feel free for sharing on your Social Media and stay tuned for next Updates ! @everyone There is a new Issue on PIVX based forks, witch can cause a "wrapped serial" attack on ZeroCoins. We still set our ZEROCOIN (zVNX) to Maintenance mode till fix is ready to prevent this hack on Venox. We will Inform you about any news on this. @here We want to be sure that the real MN holders have access to NM Owners channel. @&505825415244283924> role is for "VIP" user's. If anyone would like to have access, please send us via DM a screen with proof that you still have MN, preferably with visible uptime. 👉🏼 In the near future, a new venox website will be launched. 👉🏼 Works on the new wallet are still underway. As I wrote earlier, when it will be ready, we will announce it. There is no place for rush here. 👉🏼 Altilly is a young exchange that is developing very dynamically. It is currently in the top 200 CMC ranking. If someone does not have an Altilly account yet, we will be very grateful when you use our reflink during registration. Funds collected in this way will be used for further development of the Venox project. Short Update what is currently happening in the project. Venox network is stable and we did not observe 'fake stake' problem. But we have long-term plans which we can not implement on the current version. This will allow us to introduce many important changes that will help in future development. it is possible that total supply will be changed from infinity to a specific number. it will be possible to run a super block rewards thanks to which, a few times a year (3-4 times) for a short period of time (12-48 hours) rewards from POS and MN will be increased. It will be an award for all holders and can bring ROI hunters to venox. it is possible that we will implement a dev fee which will allow to obtain funds for development. 3⃣ Searching for new ways to promote, listing on new services, looking for new cooperations. Q. When Venox casino relase? A. We are dependent on the cryptoslider team. We are not working on it personally, so we are waiting impatiently with you. Q. When is the new wallet relase? A. As soon as it will be tested and ready for publication. Q When is the new exchange listing? A. After the release of new wallet. Due to the fact that we have to pay for wallet update on exchange. Altilly is paid, they wait for information from us that new wallet is ready. To receive WorxS rewards, I recommend create and sign a new address. I am pleased to announce a new partnership with WorxS Platform. After registration on this platform you will receive participation in the masternode rewards launched especially for WorxS users. To register, enter !acc here 👉🏼 <#550068549671190548> or on # bot-commands on the WorxS server.